Other Saxophone Manufacturers like Keilwerth, Beaugnier, Noblet, etc. The Couf Superba I is a highly sought-after saxophone, and this one is a rare early example (at least I’ve never seen one this early before) in good condition with most of its original lacquer intact. It has been overhauled with Noyek resonators, and they give the tone a punchy edge to the dark core that works well. The rolled tone holes look great! This horn has just been put into good playing condition and plays well on the current pads. This is a professional horn in every way. It was the pinnacle of vintage saxophone design by the Keilwerth company, and it was the best vintage saxophone made in Germany. It has a big, rich tone with a lot of complexity, and lots of power. For your viewing pleasure, this is a super rare original gold plate Couf Superba 1 alto. This horn is not available for sale, but it is worth seeing. The matching tenor (68xxx) is also in the museum section of this site. The Couf Superba 1 Alto is a professional horn in every way. It was the pinnacle of vintage saxophone design by the Keilwerth company, and it was the best vintage saxophone made in Germany. I have a pair of these in my personal collection also. Couf Superba 1 Baritone Saxophone 83xxx Fresh Repad! After looking for one of these for years, finally, I got a Superba 1 soprano in stock. And this one has nice original lacquer. These fine professional horns were made by Julius Keilwerth for Herb Couf, who was a saxophone teacher and music entrpreneur in Detroit, MI through the middle of the 20th century. This horn has just received a well-done fresh overhaul, done by Dan Hansen in Texas. Dan’s detail-oriented, snappy-feeling pad work gives this horn just what it needs to play its best for many years to come. The tone on these horns was made famous by Grover Washington Jr, who famously played Superba 1 saxophones on his earlier albums. The fat, rich core tone works great for any kind of music, but with a mouthpiece with a bit of baffle, you get a fat, dark core with a bright, crisp edge, and that is the tone that lots of people go for in jazz soprano playing. Couf Superba 1 Soprano Original Lacquer Fresh Overhaul! After looking for one of these for years, finally, I got a Superba 1 soprano in stock. And this one has nice original lacquer. These fine professional horns were made by Julius Keilwerth for Herb Couf, who was a saxophone teacher and music entrpreneur in Detroit, MI through the middle of the 20th century. Couf Superba 1 saxophones are outstanding instruments, made to the highest standards and possessing a uniquely rich, powerful tone that is at once (roughly speaking) similar to both a vintage Selmer and to a vintage Conn. The tone on these horns was made famous by Grover Washington Jr, who famously played Superba 1 saxophones on his earlier albums. The fat, rich core tone works great for any kind of music, but with a mouthpiece with a bit of baffle, you get a fat, dark core with a bright, crisp edge, and that is the tone that lots of people go for for jazz soprano. It works well too, with a classical mouthpiece, giving you a round, dark, warm, centered soprano sound. There are not many of these Superba 1 sopranos around, and this is a beautiful example that also has a fresh, well-done overhaul. It is an easy, turn-key purchase that should make somebody really happy! Here it is, for some lucky person. It took me three years to find another nice early Couf Superba 1 like my personal tenor (also 68xxx) and the one that I sold to a good friend who played every horn in the shop and picked his 68xxx Superba 1. They play surprisingly much like an SBA tenor but with more lush palm key tone (stays fat where the selmer thins out up top). 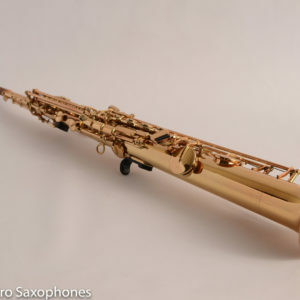 This is a rare Keilwerth-made Couf Superba I tenor saxophone. It has rolled tone holes, and the finish is black nickel. This is the first Couf that I have seen with this finish, which is much more common to find on the Keilwerth SX-90R which is the present rolled tone holes Keilwerth model. This horn should be a really good player when restored. If it’s like my personal Superba I, then it will have a big dark, powerful tone that pushes you to play what it wants to play. These horns sound loud even when you’re playing softly. It wants to blow the walls down, and it works great with a range of mouthpieces. This one ships in a nice pro-tec contoured hard case. Couf Superba 1 Tenor Saxophone 88xxx Ready to Go! This is a Couf Superba I tenor on original gold plate (not lacquer). This is the model of horn that Grover Washington Jr. played, and it is the predecessor of the rolled tone hole, professional Keilwerth SX-90r and similar horns, like the shadow. 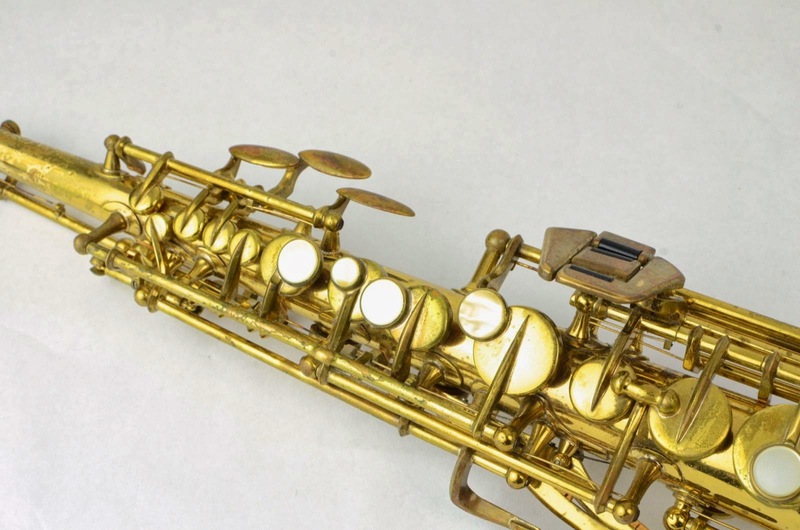 This sax has no dents or dings, and two posts have been resoldered though it is very hard to tell. It has just been overhauled by Matt Stohrer, who is one of the best in the business, both based on his reputation, and based on my experience. It plays GREAT with domed metal resonators. Everything is just as it should be, and the horn has a big dark tone with great fatness to it and lots of power. This is a rare Keilwerth-made Couf Superba I tenor saxophone. It has rolled tone holes and original lacquer. Other key features include the comfortable, modern-like keywork, the oversized pearl key touches, and a very convenient high F# included. These horns are what I almost always recommend for people looking for a big, dark vintage tone with modern keywork. ( Buffet Dynaction and Super Dynaction are the other main options for that.) That is, if I can find one. They are typically fairly hard to find in good physical condition. For a bargain price, you can get a really good playing horn. This is a great example of a Couf Superba I Baritone Saxophone. The Couf bari has a big, warm tone and sounds as good as any other vintage bari out there. The keywork is comfortable, and the horn has good intonation as well. This one has the low A key, and goes up to high F. Lacquer is in great shape with some wear on the upper bow and neck. It comes in a new premium Protec Contoured case, which is great for shipping. Speaking of bari shipping, I can ship to Europe and several other countries (ones that have a USPS size limit of 108 in.) for only $250. This horn has older pads that still seal well, so plan on a repad in the next few years, depending on how much you play it. This is a super-rare original lacquer Couf Superba I Low A Baritone saxophone with range from low A to high F#. It plays Great with a fresh, full overhaul done by Steve Collins of Collins Hornworks. Steve is a pro bari player himself, as well as an outstanding tech, so you get a horn that really plays well from the hands of a bari-playing tech. These Superba 1 Baritones have a big, rich, fat tone that stays full across the whole range of the instrument. This horn has a huge sound, and it can be pushed as much as you want. The intonation is good, and the ergonomics are quite good, especially for a vintage horn. This is a super-rare original lacquer Couf Superba I Low A Baritone saxophone with range from low A to high F#, freshly overhauled and playing great. One of the most lauded modern horns by people who like vintage horns. This is a beautiful solid nickel silver Keilwerth SX90R that is part of a limited edition of these made with this brushed finish. It is basically the same as the Shadow model, but with a beautiful platinum looking brushed nickel finish rather than the black nickel. This horn was picked out of a bunch of new Keilwerths as the best one by far, back in 2007, and was one owner, pro-owned until now. I got it and had several pads replaced and the rest adjusted, and had a very good neck fit done, all by Matt Stohrer (which improves Keilwerths a ton). The horn now plays really well – probably better than a new one, because of the neck fit. The price here is about $2k lower than a new horn, and this horn has only minor wear from playing and is in beautiful shape. Leblanc System Alto Original Lacquer Rare! Rarest horn on the site right now. This Lyon and Healy Semi-curved soprano is a real find. This is a saxophone that I will probably only see once. It’s a rare Beaugnier Paris curved soprano, made mid-century by this small instrument maker in France. Beaugnier saxophones are not yet appreciated as much as they deserve to be. This company produced a small number of high-quality saxophones made by hand and sold them both under their own name, and under other brand names, like Noblet and Vito. These horns all have a rich, centered, medium bright tone that is reminiscent of other French saxophones of that time, like Selmer, Buffet or Couesnon. 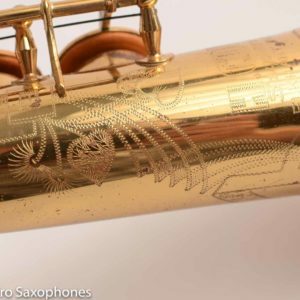 Beaugnier was a small saxophone maker in Paris who made some excellent hand-made horns over several decades, and almost all were sold as (top-quality) stencils (made by Beaugnier for other saxophone makers). These horns come in several different vintages, and the precise dating is not quite nailed down yet, because there isn’t a lot of data surviving. In any case, all of the Beaugnier’s that I have played have been very impressive saxophones. 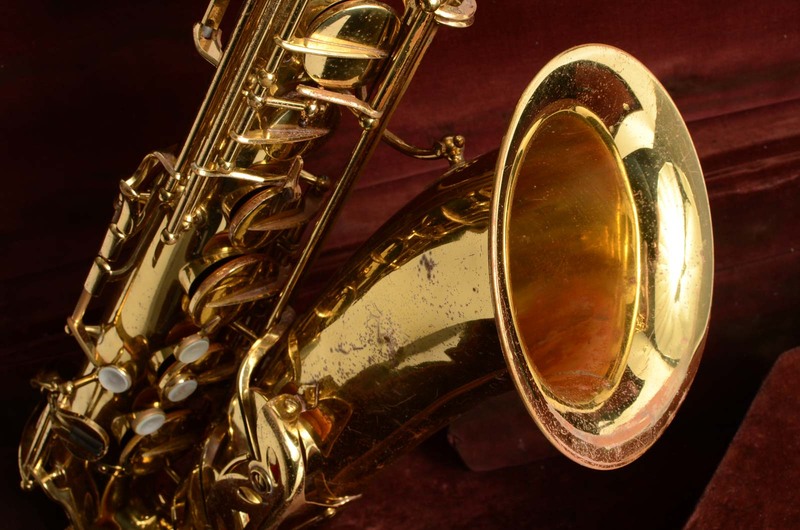 The tone is somewhere between Selmer and Buffet – French, lyrical, interesting, and flexible. This is my first experience with a Rampone soprano, let alone a saxello, and I am pretty impressed. This horn has the best-looking gold plate finish that I have seen on a modern horn, and it is a heavy gold plate that is much more generous than the electroplated horns that you see from other manufacturers today. The pad work feels good under the fingers, and the keywork is comfortable and modern. Although the horn feels modern, the tone is big and warm, more like a vintage Conn than like a Selmer or Yamaha, and that is a big plus in my opinion. These rarely come up for sale, so get this one now, and you’ll be into it way less than the new price, for a horn in near mint condition, with no wait time. The good folks at TenorMadness have been putting a lot of work into developing a new saxophone for several years now, and when one came up for sale, I just had to get it just to see what was up. Randy at TenorMadness generously offered to do an additional setup on this horn, together with adding the various improvements that he has been developing over the last year or so. That work is just completed, so this horn is just like all the current TM Customs now. Vito / Beaugnier Straight Soprano 23xxx Rare! This is a saxophone that I had not seen before. It’s a rare Beaugnier Paris soprano, made mid-century by this small instrument maker in France, and sold to Vito (France) to be sold under their name. Beaugnier saxophones are not yet appreciated as much as they deserve to be. This company produced a small number of high-quality saxophones made by hand and sold them both under their own name, and under other brand names, like Noblet and Vito. These horns all have a rich, centered, medium bright tone that is reminiscent of other French saxophones of that time, like Selmer, Buffet or Couesnon. Sometimes I end up with a sax, you know? And this is one of those. This appears to be a genuine (not stenciled) York saxophone, and it is physically complete and not in awful shape. The toneholes appear to be a combination of Martin style soldered (up top and down low) and regular drawn (stacks) and the keywork appears somewhat Buescher-like… so maybe the body tube is York and the keys are Buescher. But I am not sure. Anyhow, it’s a vintage tenor that might be fun to mess around with, all the parts are there, and you’ll probably be the only guy on the block that owns one. It makes saxophone noises on the clanky current setup, and you can tell it will have a big, wide, dark tone when overhauled. Get it cheap, and have some fun with it!